At 5:06 P.M. on Tuesday, 20 November, just as many Americans were leaving for their Thanksgiving break, the political news website The Blaze ran a story about a lesson plan from Texas that asked high-school students to consider whether the Boston Tea Party met the definition of an act of terrorism. I’ve previously noted a pattern of right-wing media reporting on supposedly faulty teaching of Revolutionary history just before Thanksgiving. That timing means that the stories can play out over long weekends while audiences are home and school administrators are away from their offices and unavailable to coordinate a reply. In this case, The Blaze responded to comments that the lesson plan was no longer circulating by saying that it had been on the web as recently as January 2012. Which suggests that the site had sat on this dire threat to Texas schoolchildren for more than ten months without checking further. And then Thanksgiving break approached. Aside from Houston’s CBS affiliate and the Daily Mail tabloid in London, the report appears to have been picked up largely on right-wing blogs. [Personally if I wanted to blog respectably about politics, I’d keep away from the term “Blitzkrieg,” but that’s just me.] Because there really wasn’t a story in that lesson plan. Read the following to the students as a whole as if it just happened within the hour in a location near by. News report: A local militia, believed to be a terrorist organization, attacked the property of private citizens today at the port. Although no one was injured in the attack, a large quantity of merchandise, considered to be valuable to its owners and loathsome to the perpetrators, was destroyed. The terrorists, dressed as natives and apparently intoxicated, were able to escape into the night with the help of local citizens who harbor these fugitives and conceal their identities from the authorities. It is believed that the terrorist attack was a response to the policies enacted by the occupying country’s government. 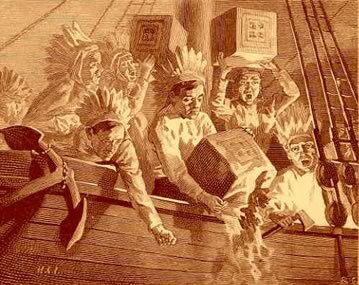 Do you think that in the eyes of the British that the Boston Tea Party was a terrorist activity? Why or why not? Were the colonists justified in taking this action due to their beliefs? Is anyone ever justified in committing these types of activities? What drives people to do this type of activity? These are things that we will explore further. The lesson plan leads on to a discussion of the U.S. prison at Guantanamo. It asks some important if ill-phrased questions (“Even though our Bill of Rights states that no ‘cruel and unusual punishments inflicted,’ should that apply to non-citizens (or prisoners)?”) and skips others (Since over 570 of the 779 men and boys held at Guantanamo since 2002, plus 87 of the 166 men still held there as of 3 October, have been cleared for release, should the U.S. have imprisoned them there at all?). 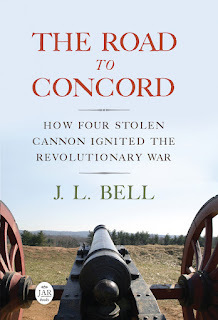 In short, while starting from the provocative example of the Boston Tea Party (one of the most controlled, though costly, acts of political violence in pre-Revolutionary America), the lesson plan actually ends up reinforcing a pretty common American perspective on terrorism: it’s something other people—particularly mysterious, leftist, and/or non-white, non-Christian people—do to Americans and our close allies. I suspect the folks at The Blaze never read that far. We did a similar thing in my world history class in high school. We were told to imagine that our country was in a huge depression having just come out of a war. We got information on 4 candidates for President, and were told to vote for them. The class overwhelmingly voted for Hitler. Scary. Of course, Hitler came to power as a minority candidate within a parliamentary system. His share of the popular vote had actually gone down in the most recent election. But Germany’s political class was willing to try an obvious extremist. Now I assume that exercise didn’t make you and your colleagues think like Nazis for the rest of the year. One hopes it just made you think. As a public high school sophomore in 1969, I took 'Comparative Economic and Political Systems' a class that asked us to consider how various situations might be addressed in the US, the USSR, and Kwakiutl Indian societies. Even in the 60's it, and the teacher, were looked upon with deep suspicion by the community. Instead of being handed 'facts', it was the first time I and my fellow student were asked to think about what it meant to be an American. Ten more years of schooling after that, and it is still one of the best classes I ever took.